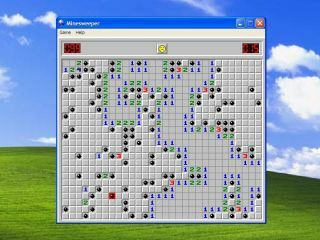 Click-for-click, nothing has wasted more time than Minesweeper, a little game that debuted back in 1990 as part of the Windows Entertainment Pack, before being promoted to a standard feature in Windows 3.1 and onwards. Less obvious than Solitaire, less concentration required to play. What better way to hide from the boss while waiting for the internet to be invented? Like most Windows games, there's more to Minesweeper than just killing time. It was partly intended as a way of teaching people basic mouse controls in an era where most computing had been text-based. Left click for the mines. Right click to place a flag. The more advanced Solitaire was a primer for drag-and-drop controls, just as the more recent puzzler Inkball was intended to get people more comfortable with pen based controls on the Tablet PCs that never actually took off. Easily the least memorable of the set was Hover, partly because 3D in Windows is no longer a technological feat by anyone's standards, but mostly because it was astronomically dull. Still, it has its fans, and it served as an excellent way for Microsoft to prove that Windows 95 had a chance of replacing DOS as the gamer's operating system of choice. Other games, like Pinball, HoverBowl and Spider Solitaire, have been added to Windows over the years in the form of Plus! packs, but never really become well known until added to the actual operating system. Most recently, Microsoft promoted Spider Solitaire to official Windows game for Vista, with the robot puzzle game Tinker the last of the utterly mis-named Windows Ultimate Extras. Minesweeper was a Microsoft original, written by Robert Donner and Curt Johnson, and hasn't changed much over the years. In the unlikely event you've never played it, the gist is that you start with an empty field (its size and number of mines determined by difficulty setting) and have to uncover squares one at a time. Underneath each is either a space, a number, or a mine. The numbers tell you how many mines are in the adjacent boxes, the mines kill you dead. To win, you have to clear the field without touching a mine. It's a relatively simple game of deduction, but satisfying. The main alterations to the game have been simple ones. The difficulty was slightly tweaked in Windows 2000 and onwards, and Microsoft hired Oberon to do a full rewrite for the Vista version. Sadly, this cut out our favourite feature of the originals: the cheat code. Pointless as it sounds, if you're still on Windows XP, give it a try. Load the game, type 'xyzzy' and press the left shift key. Now, watch the very top left of your screen. When your mouse cursor hovers over a safe square, you'll see one single white pixel. Move over a mined square, and it becomes black. It's an eyesight-killer of an easter egg, but an excellent way to impress your friends. As innocuous as it seems, Minesweeper hasn't been without its critics. To most of us, mines are just a handy framework to wrap the deductive gameplay around. This isn't the case elsewhere in the world, where they remain a threat, and a symbol of pain and suffering. In 2001, a group calling itself the International Campaign to Ban Winmine attempted to make Microsoft choose something less controversial as its subject matter, and there have been other similar protests over the years. For Vista, Microsoft finally capitulated, and began offering a flower based alternate tileset. While Minesweeper itself has remained relatively static, there have been plenty of third-party versions that have taken a new spin on the basic idea. To name just two, Crossmines is a much more complex version, featuring linked mines and unusually shaped blocks, while BeTrapped switches the minefield for booby traps in a Cluedo style house, and wraps the whole thing up in a mystery story. The sad thing is that no matter how much you play, you'll never be as good as this. Still, you'll have plenty of time to practice your skills. Wherever computing takes us in the future, it's a fair bet that Minesweeper will be along for the ride.